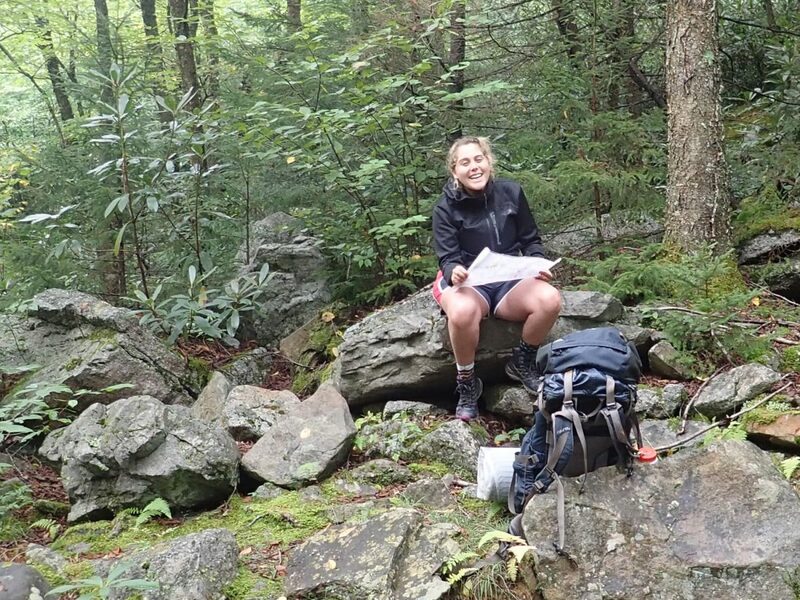 Last fall I went on a training expedition to the Dolly Sods Wilderness in West Virginia. It was a 7-day backpacking course through what felt like an endlessly changing terrain. We hiked through large open fields, patches of dense forest, up to peaks with vast stunning views, and, my personal favorite, across a river in the rain. As I look back I am able to laugh at myself trudging my little legs through deep mud and rocks, but at the time there wasn’t a lot of humor in it. It was a rainy and cold course, and my rain jacket and mental preparation were less dependable than I had hoped for the infamously muddy trails of “The Sods”. The rain soaked through my coat on day two, and left all of my warm layers wet and useless for the next five days. "I thought I just needed to toughen up, but really there was a much deeper journey going on." When you’re out on course, it’s not like you can just go home at night and throw your clothes in the dryer or grab a clean set. In the backcountry you’ve got what you got and you have to make it work. I think that’s what makes some people fall in love with spending time outside: When convenience is removed, you have to get inventive and resilient. At least that’s what I told myself, feeling a bit like one of those heroine characters on a journey of self-discovery like Elizabeth Gilbert in Eat, Pray, Love. “You are an Outward Bound instructor,” I would think. “Show some grit, girl.” I thought I just needed to toughen up, but really there was a much deeper journey going on. Being soggy, wet, and cold was not in my comfort zone, but it wasn’t nearly as scary and difficult as being soggy, wet, and visibly struggling. I felt exposed and vulnerable. I think somewhere deep inside I believed that if my co-workers saw my struggle I would be written off or no longer seen as strong enough to do my job. As a woman, it wouldn’t have been the first time I was denied opportunity because a superior feared I would be “too easily affected by emotion.” I had only known the discomfort of struggling as a weakness that would keep me from the things I hoped to one day accomplish. At Outward Bound, we focus on character education, which means we use the moments of challenge the wilderness provides to reflect on how we react, what thoughts and emotions it brings up in us, and how we can grow to handle challenges better. It’s not about coming out as an expert but about being willing to jump in, try your best and use every struggle as an opportunity for growth. That is just as true for participants as it is for instructors. I really like being self-reliant and, even more so, I like to be the person who’s prepared enough to take care of others. But standing there, shivering in my cold, wet boots, I had to learn to accept help, rely on my crew, and own that the only person assigning negativity to my experience was me. "The only person assigning negativity to my experience was me." It was time for a perspective shift. It was time for me to let my crew in and trust that, even if they had seen me as weaker (which they didn’t), I had a responsibility to advocate for myself and trust that my opinion of myself was the one that truly mattered. My crew was responsive and caring; people gave me dry socks and assigned me roles that kept me dry even though I was not the only one in wet boots. That’s the beauty of Outward Bound—we choose to walk into challenge with the hope that we will walk out more equipped and more self-aware. I could not do my job nearly as well as I do now had I not been willing to learn from my training experience. I used to think that what I needed to be a successful instructor was the ability to encounter every moment out in the wilderness with ease and confidence, but now I know that it is so much more than that. I am better when I know when to ask for help. I am better when I let my co-instructor’s strengths shine where I may struggle. I am better when I lean on my course directors to help me find the best tools and lessons for my students. I am better when I am able to be transparent with my participants about the things that challenge me, and the ways I have learned to overcome them. Most of all, I am better when I believe that I am a strong, kind, compassionate woman who can use her moments of struggle to become stronger, kinder and more compassionate.